The official name of this set is not known. Although this article is based on an official set confirmed to exist, the name of the article is merely a conjecture. 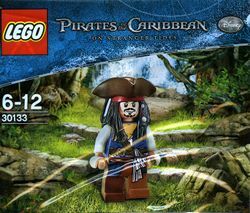 This is the third promotional set to contain a version of Jack Sparrow. The LEGO Group accidentally printed the polybags of this set showing the Jack Sparrow minifigure to have a white face. However, the actual minifigure included has the normal Light Nougat face. This is the only set to contain a Jack Sparrow with a waistcoat and tricorn hat. Facts about "30133 Jack Sparrow"
This page was last edited on 12 January 2016, at 18:57.